I recently had a fan with a spider inside it. I couldn’t shake it out. I turned on the fan and nothing happened. I wanted to turn it on to keep me cool as I went to bed but I was convinced that it would try to climb out and get launched across the room into my mouth. I had a roach crawl into my ear once. It was in there for four days. I could hear him trying to get out. I heard of a woman who had a spider’s nest in her ear. All it did was cause a scratching and rustling now and then until she went to the doctor who flushed it out with water. Biff has created a new crowd-control weapon: The Ballistic Spider-Launcher! Seriously, how many crowds, even rioting crowds, could maintain cohesion and purpose if they were being pelted with spiders..? Mark and soilent have officially terrified me. Time to get earmuffs. Before this comic, I was afraid of spiders. Now I’m afraid of ceiling fans too. 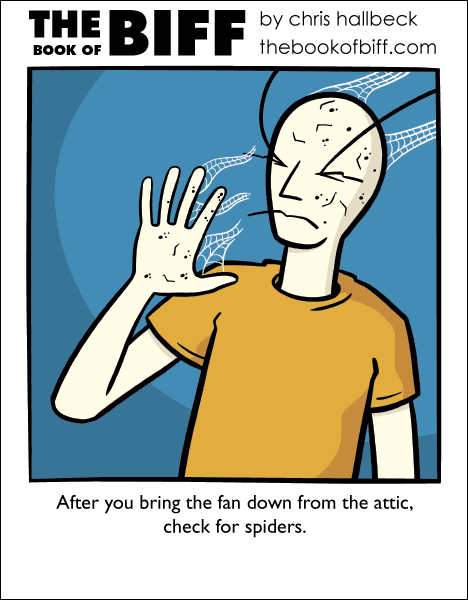 You don’t want to be there when the spiders hit the fan.